A week after the infamous 1949 April Fool’s Day radio hoax reported a swarm of wasps descending on Auckland, there is news of the second ever invert New Zealand stamp found in the small Bay of Plenty village of Kotuku. The source is the village postmaster Jack Cavanagh, who has already alarmed the authorities with his penchant for attracting publicity. Not only did he propose the new White Island stamp, he is claiming an inverted misprint is among the contents of his Post Office safe stolen and blown up. It is election year and the fallout from the April Fool prank has the Police and Post Office hierarchy in a tailspin about this latest potential public relations disaster. This is the final in the comic Cavanagh family Up the Creek trilogy. In Gold in the Creek the village fought restructuring. Geyser in the Creek offered tourist salvation. 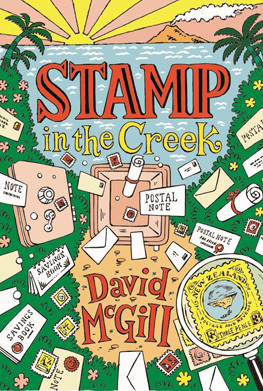 Stamp in the Creek has the youthful postmaster facing departmental disapproval and the disappearance of his son after witnessing the theft of the safe. The stationmaster, the grocer and his baker wife, the village projectionist, the priest newly arrived from Ireland and other local stalwarts help Jack in his search for his son, while unscrupulous outsiders stop at nothing in their pursuit of the missing stamp, including kidnap, arson, blackmail, stand-over tactics and car conversion. The police are diverted but the press home in, the story going national in Truth, fulfilling the worst fears of a public service scandal. 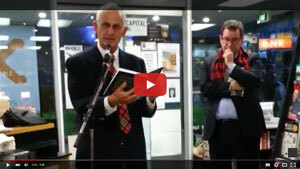 Stamp in the Creek available from publisher $29-95 including postage.